It’s been nearly three weeks since Microsoft last rolled out a new Windows 10 build to Insiders on the Fast ring. Well, three weeks if you don’t count the buggy, chaos-causing internal Build 16212 which leaked out last week. But today the wait for a new update is over, as Build 16215 comes to the Fast ring, and the good news is this release is definitely worth your attention, not least because it introduces new UI for both the Start and Action Center that makes use of Microsoft's new Fluent Design System. The software giant describes this as "an eloquent design system for a complex world," and we explained all about it here. Horizontal resize: The frame now starts resizing horizontally immediately (like vertical resize), as opposed to only "snapping" to certain widths. Diagonal resize: The frame can be resized diagonally. Resize grips: It’s now easier to "grip" the edge of the frame to start resizing. The Action Center has been redesigned with a new look and a new layout and we think it’s a big improvement (see below). What are your thoughts? Build 16215 includes some Edge improvements (as always). You can pin favorite websites to the taskbar once more, and finally switch to full screen mode by pressing F11 as you can in all other browsers. You can annotate books in Edge, the PDF feature has been improved, and there have been various other minor changes made throughout too. Cortana improvements in this build include camera roll insights (Cortana will prompt you to create a reminder if she notices event posters in your photos) and a lasso (pen users can circle event information for Cortana to recognize). The handwriting experience has been improved, and it’s now much easier to enter emoji on your hardware keyboard. There’s also a new touch keyboard available to play around with. In addition that, there are multiple improvements to My People, and Night Light, and to Settings and Windows Update. 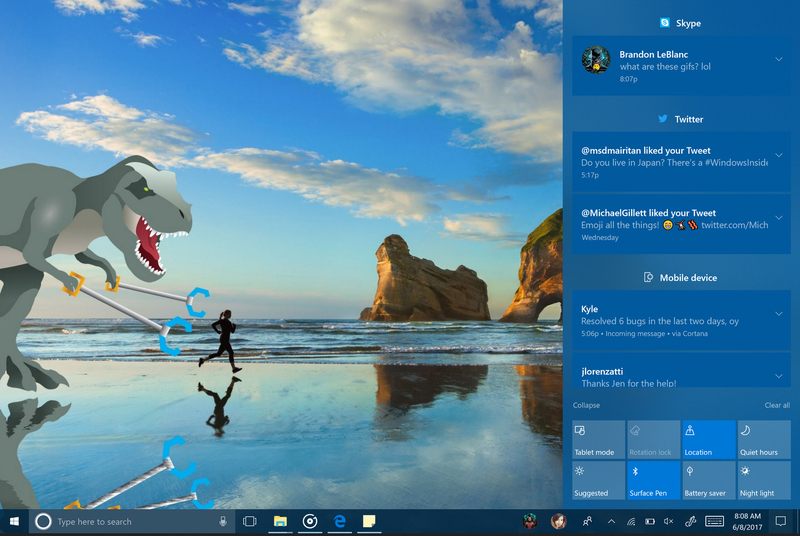 This is one of the biggest updates to Windows 10 we’ve had in a while so there’s a lot to investigate and uncover. The issue causing updating to the latest builds to get stuck at 12 percent should be fixed. Fixed the issue causing users to be unable to type in a password to log in to any UWP apps such as Netflix, Twitter, Facebook, Instagram or Messenger apps. Fixed the issue causing Outlook 2016 to hang on launch due to an issue where the spam filter gets stuck reading the Outlook Data File and the UI waits indefinitely for it to return. Fixed an issue from the previous flight where Microsoft Edge would crash when enabling or disabling extensions. Removed the power option to "update and shutdown" for now as it wasn’t working. You may see Recovery Drive tool show up under "Recently added" on Start after updating to this build. Microsoft has made a change that makes the tool, previously only accessible via Control Panel, to now be available in the Windows Administrative Tools folder in Start. Fixed an issue where an unexpected Wireless Display Media Viewer app with a blank icon was visible in Start after upgrading on certain devices. Made some improvements to the facial recognition, along with a new toast you’ll see prompting you to further train Windows Hello if having issues signing in when a large amount of backlighting detected. Fixed an issue resulting in Windows Hello Face failing to work on the previous flight for a large number of non-English languages. Fixed an issue resulting in games such as Civilization VI, Galactic Civilizations III, and Expeditions: Viking failing to launch on recent builds. Fixed an issue where inbox UWP app icons were overscaled in Cortana search results. Adjusted the text in the prompt to initiate cross device notifications from saying "Trust this PC?" to now say "You got a message on your phone. Want to see phone messages on this PC too?" Fixed the issue causing some people to hit Error 0x8000ffff while trying to launch an isolated Edge session in Windows Defender Application Guard. After upgrading, inbox apps that are the same version on the downlevel OS and uplevel OS will disappear from Start. If you are impacted by this, go to Settings > Apps > Apps & Features, select the impacted app, tap "advanced options", click reset, and that should fix it. The mini surveys we call SIUFs from Feedback Hub will not work on this build.